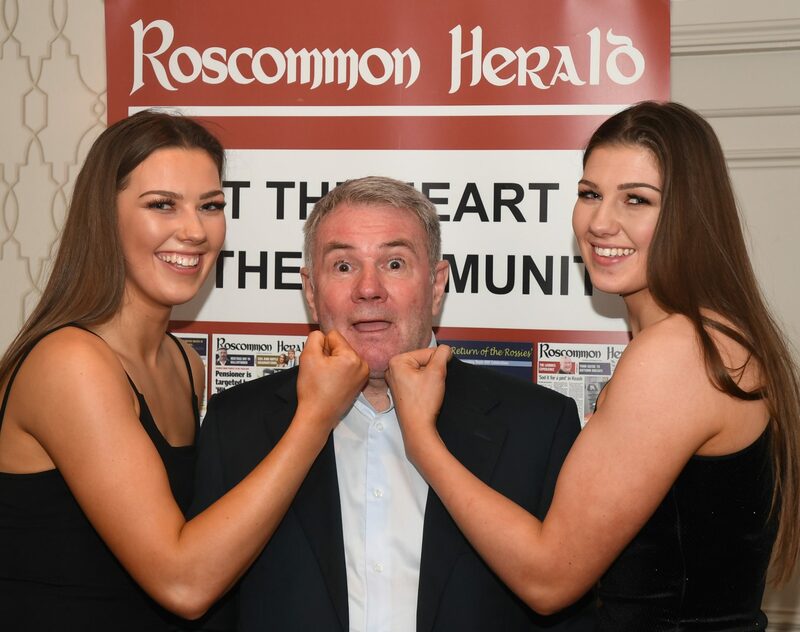 Castlerea boxer and European U-22 silver medallist Aoife O’Rourke was crowned the Overall Roscommon Herald/SuperValu Sportstar of the Year for 2018 last Friday night. The accolade crowned a remarkable year for the Trien native in which she secured Irish Intermediate, U-22 and Elite titles in quick succession, before moving on to European competition where she was forced to pull out of her gold medal fight against Turkish fighter Busenaz Surmeneli in the 75kg division. She then went on to win multi-nations gold at the Nicolae Linca Golden Belt tournament before reaching the last 16 at the World Championships in India, completing a stellar season that led to her being honoured at both the annual Irish Amateur Boxing Association awards and the Roscommon Herald/SuperValu awards last Friday. Speaking in front of a packed crowd at the Abbey Hotel last Friday night after she collected her overall prize, Aoife thanked her coach Paddy Sharkey and everyone at Castlerea Boxing Club for their part in helping her make an incredible transformation from a raw latecomer to the sport described as “the sweet science” into one of the country’s hottest prospects, to the point that the possibility of competing at the 2020 Tokyo Olympics has been discussed. “Boxing would have been a no-go at home, so I didn’t tell them (her parents) that I was going, I just went with it and got them to pick me up after!,” she revealed. On a night when her sister Lisa also picked up a monthly award after winning a European junior silver medal, Aoife admitted that boxing was something that she wanted to try out, but it wasn’t at the behest of any prompting from her family at home. “My Dad will have his say at home, but we don’t really listen. I wanted to do it and it has been an incredible experience, and I’m still learning away. “I’m very much focused on the next few months,” continued Aoife, who will compete in the Irish Elite championships at the National Stadium over the next few weekends. “Right now my primary target is next week’s national championships, and then the European U-22 finals in Russia in March, I’m not looking beyond that,” said the 21-year-old, who has been part of the association’s High Performance Unit for the past few years. O’Rourke admitted that not being able to compete in her 2018 European final was a huge let down, though she understood that the decision was taken in her own interests. “I was incredibly disappointed at not being able to take part in the final, but that’s what the doctors are there for. I’m sure they made the right decision,” she remarked. Aoife returned to a rapturous welcome in Castlerea, adding that the support she received from her home community was incredibly important to her, and will continue to be as she keeps climbing the ladder in the amateur game. “It was incredible to see that so many people were behind me, and in particular in the boxing club, that meant so much. I wouldn’t be here without them, and this honour is for them as well as for me,” she concluded.